Except, as it stands, our garden is in no fit state for a toddler. The dark days and rainy weather has turned our already patchy lawn currently into a horrible muddy swamp, the stones that once formed a path are scarce and my efforts to brighten up our outside space with some all weather plants didn’t quite come to fruition. Unfortunately, it has also become a dumping ground for our old furniture and Sean’s work stuff. It is just a sad and neglected plot with no place to play. And so, over the next few weeks I am going to spend as much time as I can find transforming the space into a beautiful, colourful, sensory space for Florence to explore and enjoy. Before the fun stuff can be sorted, we have to lay some foundations to make it a safe and practical space. Our first step is to sort out the ‘swamp’.Our garden is incredibly shady and so maintaining a lawn is quite difficult and so in an ideal world, I would happily opt for artificial grass out there but it can be quite expensive and Sean is reluctant to spend a huge amount of money on permanent improvements as we rent our home. Unless I can find a bargain, it looks like I will be planting grass seed and keeping everything crossed! The other thing we need to do is to replace the path. We have already got the slabs to square off the patio section and create a path from our conservatory doors to the back gate. Once the lawn & path are in place I’d like to split our relatively small garden into four zones – three dedicated to play and one to relaxing & dining. I hope to separate each zone with wooden planters, filled with sweet smelling herbs, brightly coloured flowers and lots of different textures. I’ve been ogling over this one I found on Oakley childcare and really want to recreate something similar. If there’s one thing Florence likes to do more than anything else it’s to make as much noise as possible. She loves music and playing instruments and I really want to provide her a space to do this as much as she wants when we’re outside too. 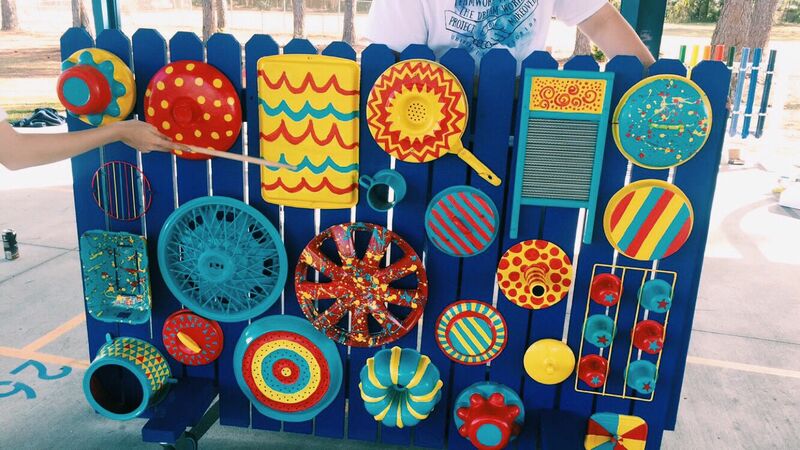 I am going to create a music wall by hanging some painted pots & pans, tin cans and pipes along the wall with some spoons and such for drum sticks. I also want to make some homemade wind chimes to put up here too. No kids garden is complete without a sandpit and water table, am I right? I had thought of using one of the sections in one of the dividing planters as a water table, and I still might, but I also quite like the look of this Little Tikes one. When it comes to Sand, as much as I’m sure all the sand tables out there are great, I just prefer the idea of a sand pit that you can actually get into! We are going to need something with a bit of a canopy above it to one, keep Florence out of the sun, and two to stop all the debris falling into it from next doors over grown trees. I really love this one from Plum as it has a bench either side of it too and I can just picture Florence & her friends sitting in there and playing together on little play dates. I also think in the long run, when Florence is that bit older, I can see this doubling up as a shop ! The third zone will be a space for open play. We are going to buy her some ride on toys including a happy hopper & a cosy coupe car which she’ll be able to play on in at leisure here. I might even invest in a little paddling pool & slide but these can each be taken out of the shed as and when we need them. I’d also like to place some mirrors and a black board on the fence around this area. I mentioned I wanted to inject some colour into our garden and with limited floor space I am planning on absolutely filling the empty areas on the walls and fences with plants & flowers! I’ve seen these gorgeous hanging planters on Amazon which will be perfect along the back fence. What would you do with our tiny outdoor space? I a determined to get outside this Spring /Summer… even if some days we only just make it out the back door!